It’s grilling season! We joined Sam’s Club just to buy a particular grill I had my eye on. 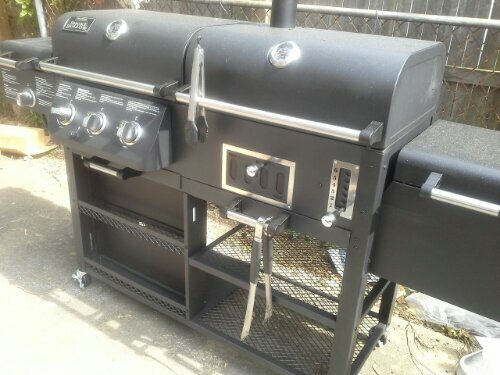 We’ve been wanting one of those hybrid grills with both gas and charcoal. I found a really cool one with that and a smoker box and a searing thing-a-ma-bob! It has pretty good reviews online, so I decided it was the one for me. So, naturally, it weighs 250 lbs. We got a couple of guys to help get it into the van chick, but getting it out was another story. Somehow we managed. It took me the better part of three afternoons to put it together. Don’t tell Ferdinand but I did have some bolts left over. In a medium bowl, combine 2 tablespoons lime juice, 1 tablespoon olive oil, chili powder, 1/2 teaspoon cumin, black pepper, hot sauce, paprika, and 2 garlic cloves. Add shrimp and toss to coat. Marinate in the refrigerator for 30 minutes. Rinse and drain the quinoa; meanwhile heat a teaspoon of oil in a saucepan over medium high heat. Sauté the onion for about 3 minutes. Add remaining 2 cloves of garlic and the quinoa, cook a minute, stirring constantly. Add water and bring to a boil. Cover, reduce heat, and simmer until liquid is absorbed, about 13 minutes. Let cool. Whisk remaining 2 tablespoons of lime juice, remaining 2 tablespoons of olive oil, remaining 1/2 teaspoon of cumin, 1/4 teaspoon of salt, and honey in a large bowl. Stir in quinoa mixture, tomatoes, chickpeas, avocado, and cheese. 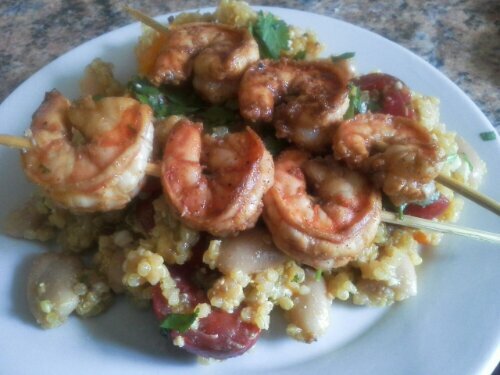 Drain shrimp and discard marinade; season with salt and thread shrimp on skewers in groups of three. Grill a few minutes on each side until opaque and cooked through. To serve, divide quinoa evenly between 4 plates. Top each plate 2 skewers. Garnish with cilantro. I only made the quinoa part of this, as I wanted a salad for a potluck. Quite tasty and easy. I doubled the recipe. Looking forward to trying the shrimp part next time.